Happy Friday Friends! I am so excited to share something new with you over here at Elizabeth Emma Designs. I spend a lot of time every week going through so many blogs and I always find gorgeous projects from fellow Stampin' Up! Demonstrators! Everyone is so creative and there are so many great ideas out there. I have decided to start featuring a few of my very favourite projects every Friday on my blog. I will include a photo of the project and a link to everyone's blog. Click on the link to check out the blog because chances are if there is one great project, there will be many more. And while you're at it, why not take the time to drop a comment and let them know I sent you. Everyone loves positive comments on their Blogs! Dawn over at Dawn's Stamping Studio made this beautiful shaker card, I love the colour combo! Krystal from Krystal's Cards made this cute thank-you card using the new Hello You thinlits, those are certainly on my wishlist! So versatile! Patty over at Patty's Stamping Spot made this super adorable mini treat box. You guys know how much I love washi and that bow punch is just to die for! 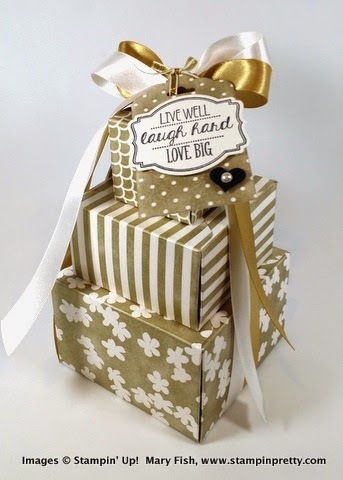 Mary Fish from Stampin' Pretty made these adorable metallic gift boxes. Go check her out, I love just about everything she creates! Erica at Pink Buckaroo Designs made these adorable Valentine Treat Holders, there's a great tutorial to go along with them, check her out.